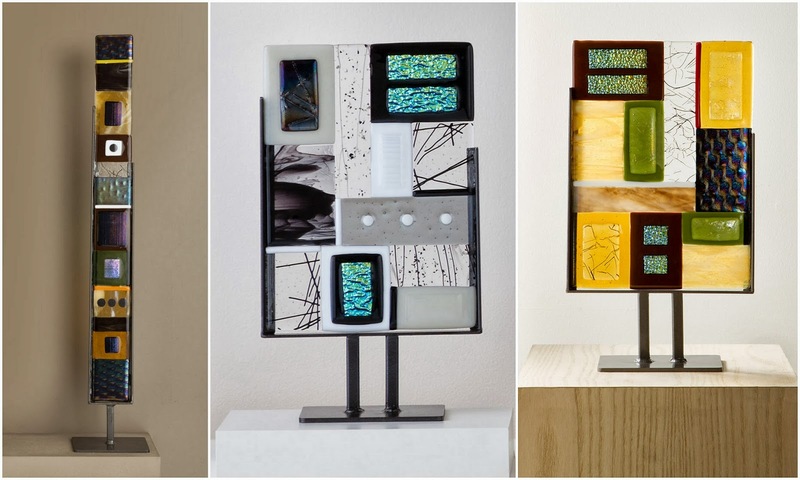 We introduced our Glass Totem Sculpture in the fall of 2012, followed more recently by two small scale Totem Sculptures to round out our collection. They are some of our most popular items and have cemented our relationship with Hands On Art Studio, the makers of these beautiful creations. They have given us a look inside their studio and details on a process that is as unique as they are. Owned and operated by Cy Turnbladh and Karon Ohm, husband and wife, Hands On Studios, Inc., D.B.A., Hands On Art Studio, is located on what was once an abandoned farm in Door County Wisconsin (Fish Creek). The 65 acre farm is home to Hands On Art Glass, Hands On Art Studio, cats, chickens, ducks, two horses, goats, a llama and Hazel the pot belly pig. There are raised bed vegetable gardens, flower gardens and a field of sweet corn & pumpkins. Hands On Art Studio consists of four studio buildings - the Art Barn, the Jewelry Cafe, the Metal Studio Buffet and the Glass Studio. The general public can visit and create ceramics, mosaics, metal sculptures, fused glass pieces and jewelry to take home. Cy and Karon believe that art and craft should be accessible to everyone and a fun process. Hands On Art Glass is created in our Glass & Metal Studios. Each Hands On Art Glass sculpture is made by hand by either the owners or their staff. The pieces are created using fusible glass. Each design is made by placing colored glass onto a piece of clear glass. These sculptures are placed into a kiln and fired to 1385 degrees Fahrenheit which fuses them into a single piece of glass. Each of the stands are created by cutting the steel and welding them by using mig welders in our metal studio. After they are welded each stand is hand painted. All the pieces are individually made and unique. The totem style has been a design way that Cy has experimented with and created in multi mediums including copper and clay in the past three decades. Expanding the totem into glass was a natural progression for him when a few years ago a local gallery owner asked Cy and Karon for some small glass strips for use in vases and potted plants. From these small, fused glass sculptural pieces the Hands On Art Glass "totems” were introduced. Thank you Hands On Art!